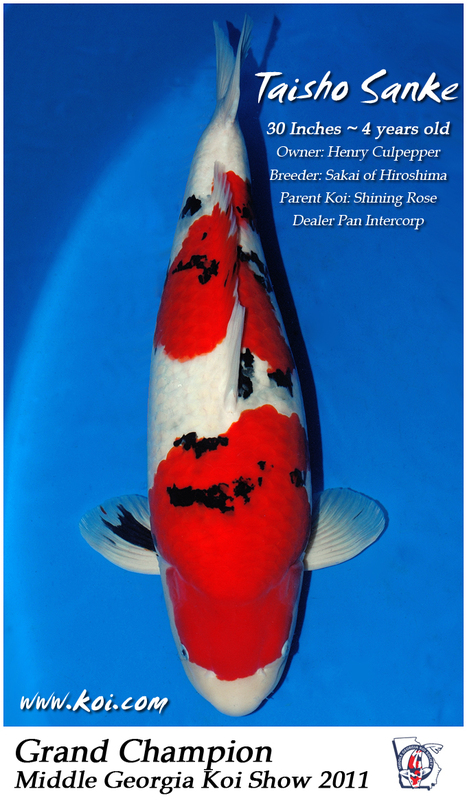 This entry was posted in Awards, Koi Shows, Sakai Fish Farm on April 5, 2011 by koiadmin. Congratulations to Don & Brenda Chandler on winning Baby Grand Champion at the 2011 ZNA SoCal Show in Gardena, California. Purchased from Pan Intercorp, this beautiful Tosai Sanke displays perfectly placed stepping stone Sumi that is a stark contrast to the pefect crimson red two step pattern. This Sanke was bred by Sakai of Hiroshima and is not even one year old yet. Im sure we will see this beauty in the running for Young Champion in the near future. This entry was posted in Awards, Koi Event, Koi Shows on April 4, 2011 by koiadmin. 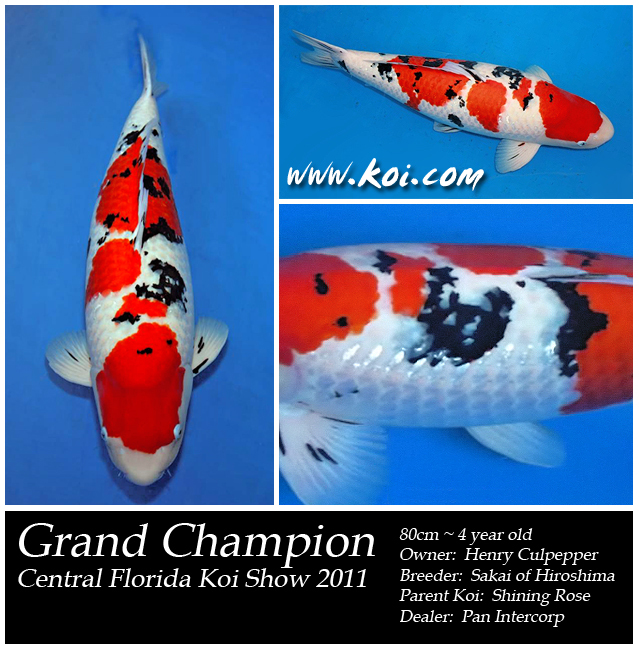 Henry Culpepper wins Grand Champion at the Central Florida Koi Show! At 80 centimeters this Taisho Sanke from Sakai of Hiroshima displays an incredible bone structure and youthful body conformation that is strong from the head through the mid section, all the way through her thick tail tube. Sakai Sanke are valued for their flawless skin, massive build, and their inky black Sumi. 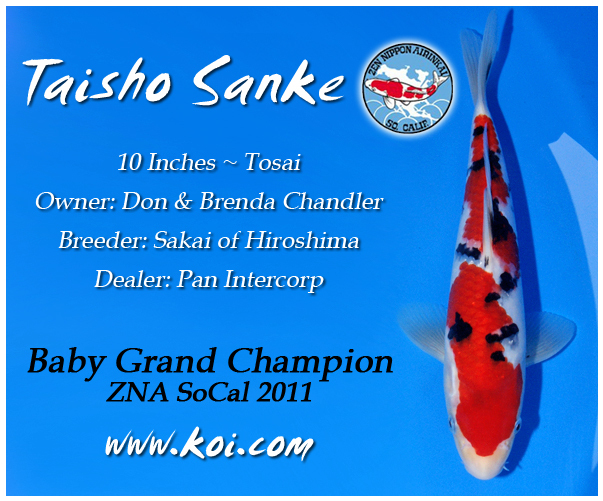 Sakai Sanke have won numerous awards at koi shows around the world including the ultimate honor of winning the Grand Champion of the All Japan Show. Purchased as a two year old this beautiful Shining Rose Sanke spent very little time in Japan before being shipped to Florida where she has been raised to her massive 80 centimeters (31.5 Inches). Henry’s mastery of koi keeping skills and pond water are proof positive that you don’t always have to keep koi in a mud pond in Japan to have it reach its full potential… Henry’s Sanke is far from her full potential. This entry was posted in Awards, Koi Event, Koi Shows on April 2, 2011 by koiadmin.